Virtual Outworlding: 2018 PEOPLE: EVENTS: Hypergrid communication quest, What we can get from MeWe? 2018 PEOPLE: EVENTS: Hypergrid communication quest, What we can get from MeWe? What we can get from MeWe? A quest? Don't you do those in stories? Yeah, but where do you think we got the idea? And, BTW, pay attention to how those stories go. We always hope that our readers will do the same. When they find themselves on a quest. MeWe offers some of the features we were using in G+. A number of people active on the Hypergrid have joined MeWe. Some active groups on the Hypergrid have been recreated in MeWe. 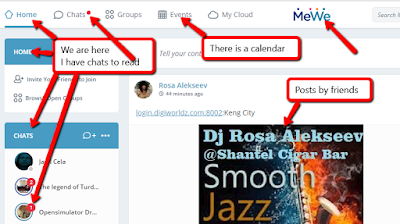 If you have an active community in G+, you may want to recreate it in MeWe. 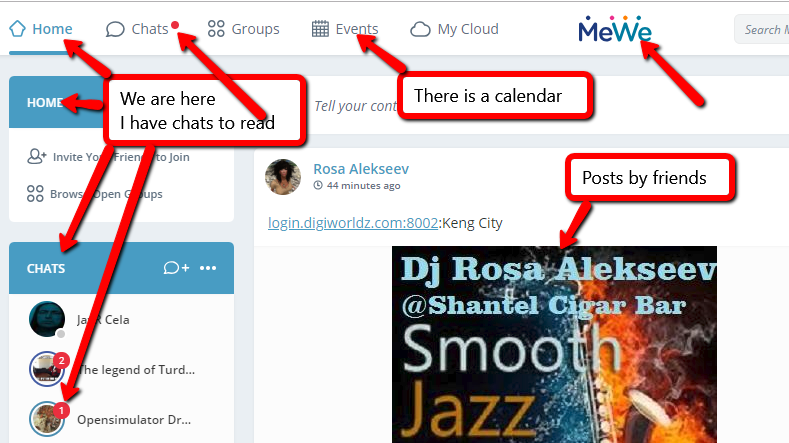 MeWe posts are available only to those registered on MeWe. MeWe is useful for ingroup conversation, not for outreach. You may need a MeWe account to open the links at this time. More groups are being added all the time, so do your own check. If you don't see a group that suits you, create your own. In Kitely, the HG address is given in the web page for your place. The prefix http: or https: indicates a web page. Do we use MeWe for web traffic?